Anyways! I had a new stylist this month. She mentioned visiting my blog and social media sites, and keeping my feedback from last month in mind. She also had mentioned a shortage of spring/summer pieces, so I was super curious as to what was inside! Honestly, I’m really not a neon girl. I like prints with neons sometimes, but that’s about it. This just wasn’t my style. I really liked these – they appeared to be ankle length (perfect for me! ), and I liked the wash, but they were sadly too small. I could button them up but couldn’t breath… um, easily. My stylist sent this since I wanted that one maxi dress from last month. (Sadly it appears to still be unavailable. Bummer!) 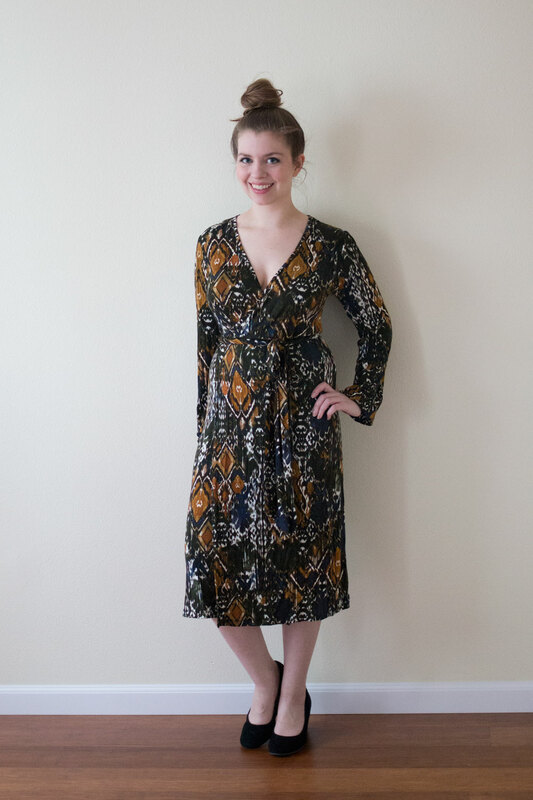 I think it’s similar, but I don’t really like midi length items on me nor did I love the material for this type of dress. 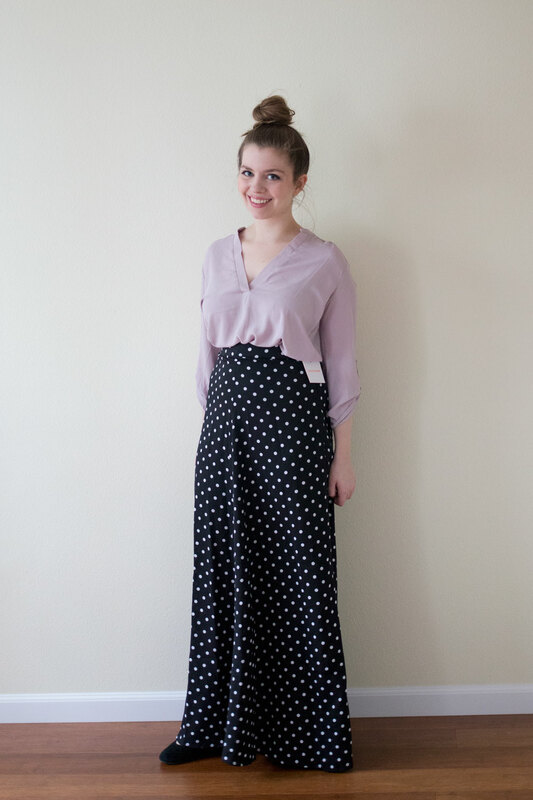 I love maxi skirts, but this one has a HUGE slit up the side. 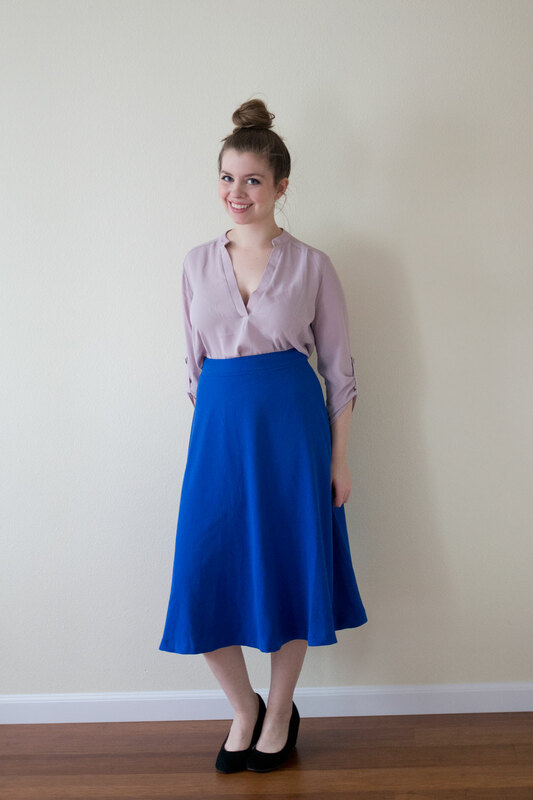 I just wasn’t feeling it since it would no longer be work appropriate, and I like pieces in my closet that I can wear to work or on the weekend comfortably. Okay, I seriously was cracking up about this. I’m sure my stylist meant well, but this honestly looked like something I would expect to see on a figure skater. It was uncomfortable too. I actually really liked this, until I put it on. It was just too long. I wish it had been above the knee, as the material was thick and high quality, plus I love the color. Bummer! All totaled, these eight items would have cost nearly $600 to keep (Yowch! Almost double last months!) and most were misses again for me. I’ve left my stylist new feedback, but I do think they listened to feedback from last time by trying new styles for me. I especially noticed that she attempted to pick items that wouldn’t show off my chest. 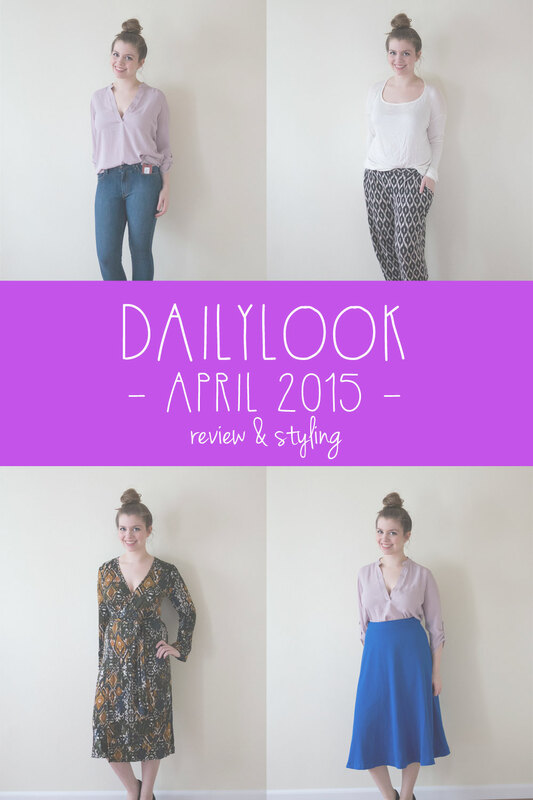 Have you tried DailyLook or a similar service? What did you think? Oh, that romper. I don’t know what I would do if a romper came in my box. I am getting mine soon (I think), and I will be curious how it goes. And $600 is really expensive! I loved that blue skirt. Could you not have kept it and just gotten it shortened? I definitely could have, I just thought for the price ($89) to have to go get it hemmed on top of that seems a bit steep. Hope your first box goes well! A Sequin Romper? Was that an April Fool’s joke? oh my gosh, that romper with those flared out shorts…that’s insane. figure skater is right. why is everything so long, i feel like that printed dress would have been cute with short sleeves/sleeveless and shorter length. hope you have more luck next month! hahaha! That jumpsuit thing is the funniest thing I’ve ever seen (not laughing at you at all, it’s just such a weird piece) But I’m glad you got a keeper this round! I signed up for this service after your first post and from what I can tell, I was put on a waitlist and haven’t received any boxes! Boo! Haha, I know, and it really looks awful on me. I didn’t know they had a waitlist – bummer, hope you’re off soon! I feel you in the price. My first box I felt it was too expensive. I asked them to include lower price range items and sale items and they did. I was pleased to see that they quickly made the change. I like how easy is to skip a month or cancel. Hope this helps! Oh that’s a great idea, I may have to ask for a few more lower priced items in my next box. Thanks for the tip, Claudia! Thanks Susannah! Definitely understandable, the price ranges are quite varied and not always the most affordable. 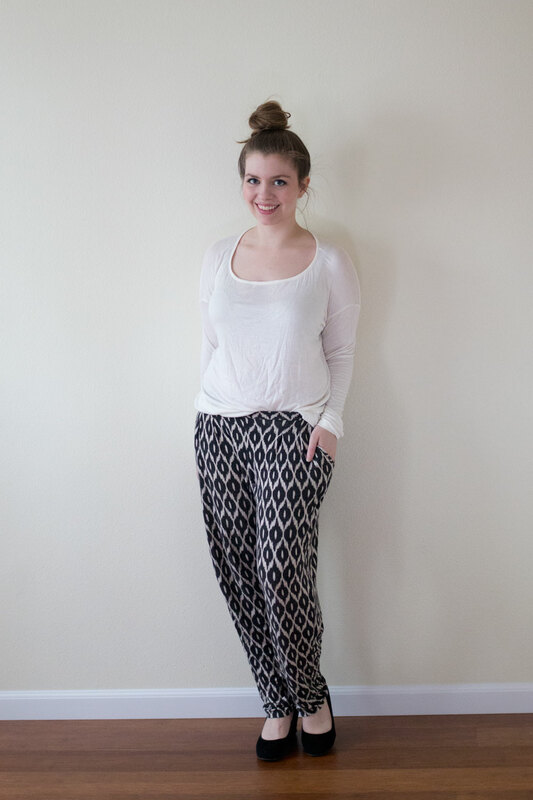 Love those black and white pants! I have never heard of this service from daily look, I would like to check it out! Cute blog and best to you! Wow, I actually think these styles are pretty cute! It’s too bad so many of them fit poorly in the bust or weren’t quite the right length. Also, what is going on with that romper?! It might be okay if the legs were a bit longer and didn’t flare…? Haha, I have no idea… the romper was definitely strange. Otherwise, the style of this box is definitely on the right track! Thanks Liz! Hope DailyLook works out for you! I love that BB Dakota red dress! If only it fit properly! I hope your stylist works with your feedback for next time! I know right? Bummer, and I hope so too! Sorry you had so many misses! I’ll be anxious to see how they adjust for next month. I wish the skirts had worked for you, I like them all. And that romper has no other description than LOL. Me too, I wish they had been just a bit shorter! Oh, that romper. Hahaha. I really like the blue skirt, but I agree with you about the length. Too bad! Haha, the romper is good for a chuckle. Agreed on the skirt too, oh well! That figure skating romper cracks me up! I loved the pieces that you kept though. I’m still on the Stitchfix craze. And yowch is right for $600 if you kept the whole thing! Is it a monthly subscription? or is it like Stitchfix where you can choose monthly or whenever you want to send the next one? It’s monthly, but you have some flexibility on delivery dates so I think you can set it to be less often than monthly if you like! See, you got some color! I got a peach colored shirt, but the sleeves weren’t even hemmed on it (I’m not a fan of that look). Otherwise everything was black or gray and definitely meant for the winter. Like, a long sweater or a dress that was supposed to have multiple layers under it. It felt like they sent me the extra winter inventory. I was so insulted.